Legion of Merit w/ Combat "V"
Bronze Star Medal (2) w/ Combat "V"
James Bond "Jim" Stockdale (December 23, 1923 – July 5, 2005) was a United States Navy vice admiral and aviator awarded the Medal of Honor in the Vietnam War, during which he was an American prisoner of war for over seven years. Commander Stockdale was the senior naval officer held captive in Hanoi, North Vietnam. He had led aerial attacks from the carrier USS Ticonderoga (CVA-14) during the 1964 Gulf of Tonkin Incident. On his next deployment, while Commander of Carrier Air Wing Sixteen aboard the carrier USS Oriskany (CV-34), his A-4 Skyhawk jet was shot down in North Vietnam on September 9, 1965. He served as President of the Naval War College from October 1977 until he retired from the Navy in 1979. Stockdale was born in Abingdon, Illinois, on December 23, 1923, the son of Mabel Edith (née Bond) and Vernon Beard Stockdale. Following a brief period at Monmouth College, he entered the United States Naval Academy in Annapolis, Maryland in June 1943. On June 5, 1946 he graduated from the Naval Academy with the Class of 1947 due to the reduced schedule still in effect from World War II. Academically he ranked 130th among 821 graduates in his class. His first assignment was assistant gunnery officer aboard the destroyer minesweeper USS Carmick (DMS-33) from June to October 1946. He next served aboard the USS Thompson (DMS-38) from October 1946 to February 1947, the USS Charles H. Roan (DD-853) from February 1947 to July 1948, and the USS Deming (PCS-1392) from July 1948 to June 1949. Stockdale was accepted for flight training in June 1949 and reported to Naval Air Station Pensacola in Florida. He was designated a Naval Aviator at Naval Air Station Corpus Christi in Texas, in September 1950. He was next assigned for additional training at Naval Air Station Norfolk in Virginia from October 1950 to January 1951. In January 1954, he was accepted into the United States Naval Test Pilot School at the Naval Air Station Patuxent River base in Southern Maryland and completed his training in July 1954. There he tutored U.S. Marine Corps aviator John Glenn in math and physics. He was a test pilot until January 1957. In 1959, the U.S. Navy sent Stockdale to Stanford University where he received a master's degree in international relations and comparative Marxist thought. Stockdale preferred the life of a fighter pilot over academia, but later credited Stoic philosophy with helping him cope as a prisoner of war. Stockdale exiting his A-4 fighter-bomber weeks before becoming a POW. On 2 August 1964, while on a DESOTO patrol in the Tonkin Gulf, the destroyer USS Maddox (DD-731) engaged 3 North Vietnamese Navy P-4 torpedo boats from the 135th Torpedo Squadron. After fighting a running gun and torpedo battle, in which Maddox fired over 280 5-inch (130 mm) shells, and the torpedo boats expended their 6 torpedoes (all misses) and hundreds of rounds of 14.5mm machinegun fire; the combatants broke contact. As the torpedo boats turned for their North Vietnamese coastline, four F-8 Crusader fighter aircraft from USS Ticonderoga (CV-14) arrived, and immediately attacked the retreating torpedo boats. Stockdale (commander VF-51 (Fighter Squadron 51)), with Lieutenant (Junior Grade) Richard Hastings attacked torpedo boats T-333 and T-336, while Commander R. F. Mohrhardt and Lieutenant Commander C. E. Southwick attacked torpedo boat T-339. The four F-8 pilots reported scoring no hits with their Zuni rockets, but reported hits on all three torpedo boats with their 20mm cannon. Two nights later, on 4 August 1964, Stockdale was overhead during the second reported attack in the Tonkin Gulf. Unlike the first event, which was an actual sea battle, no Vietnamese forces were, however, believed to have been involved in the second engagement. In the early 1990s, he recounted: "[I] had the best seat in the house to watch that event, and our destroyers were just shooting at phantom targets—there were no PT boats there.... There was nothing there but black water and American fire power." Stockdale was held as a prisoner of war in the Hoa Lo prison (the infamous "Hanoi Hilton") for the next seven and a half years. As the senior Naval officer, he was one of the primary organizers of prisoner resistance. Tortured routinely and denied medical attention for the severely damaged leg he suffered during capture, Stockdale created and enforced a code of conduct for all prisoners which governed torture, secret communications, and behavior. In the summer of 1969, he was locked in leg irons in a bath stall and routinely tortured and beaten. When told by his captors that he was to be paraded in public, Stockdale slit his scalp with a razor to purposely disfigure himself so that his captors could not use him as propaganda. When they covered his head with a hat, he beat himself with a stool until his face was swollen beyond recognition. When Stockdale was discovered with information that could implicate his friends' "black activities", he slit his wrists so they could not torture him into confession. Stockdale was one of eleven U.S. military prisoners known as the "Alcatraz Gang": George Thomas Coker, USN; George G. McKnight, USAF; Jeremiah Denton, USN (he graduated with Stockdale from the Naval Academy); Harry Jenkins, USN; Sam Johnson, USAF; James Mulligan, USN; Howard Rutledge, USN; Sam Johnson, USAF; Robert Shumaker, USN (originated the name "Hanoi Hilton"); Ronald Storz, USAF (died in captivity); and Nels Tanner, USN. Because they had been resistance leaders they were separated from other captives and placed in solitary confinement in "Alcatraz", a special facility in a courtyard behind the North Vietnamese Ministry of National Defense, located about one mile away from Hoa Lo Prison. In Alcatraz, each of the prisoners was kept in an individual windowless and concrete cell measuring 3 by 9 feet (0.9 by 2.7 m) with a light bulb kept on around the clock, and locked in leg irons each night. Of the eleven, Storz died in captivity there in 1970. President Gerald Ford presents the Medal of Honor to Stockdale at the White House on 4 March 1976. Stockdale was released as a prisoner of war on February 12, 1973 during Operation Homecoming. His shoulders had been wrenched from their sockets, his leg shattered by angry villagers and a torturer, and his back broken. On March 4, 1976, Stockdale received the Medal of Honor. Stockdale filed charges against two other officers (Marine Corps Lieutenant Colonel Edison W. Miller and Navy Captain Walter E. "Gene" Wilber) who, he felt, had given aid and comfort to the enemy. However, the Navy Department under the leadership of then-Secretary of the Navy John Warner took no action and retired these men "in the best interests of the Navy." After his retirement in 1979, he became the President of The Citadel, The Military College of South Carolina. His tenure there was short and stormy as he found himself at odds with the college's board as well as most of its administration, by proposing changes to the college's military system and other facets of the college, including the curbing of student hazing. He left The Citadel to become a fellow of the Hoover Institution at Stanford University in 1981. During his twelve-year tenure at the Hoover Institution, Admiral Stockdale wrote and lectured extensively. His primary focus was ancient Stoicism and the Roman slave-turned-philosopher Epictetus, whose lessons captured in The Enchiridion Stockdale credited with providing him strength during his ordeals as a prisoner in the Hanoi Hilton. Between 1981 and 1988 Admiral Stockdale also served as chair of the White House Fellows under the Reagan administration. In 1984 Admiral Stockdale and his wife Sybil co-authored In Love and War: the Story of a Family's Ordeal and Sacrifice During the Vietnam War which was published by Harper and Row. It recounts Stockdale's experiences while in Vietnam and in alternating chapters also tells the story of Mrs. Stockdale's early involvement in the League of American Families of POW's/MIA's which she helped to found and served as its first chairperson. Their story was later made into an NBC television movie under the name In Love and War starring James Woods and Jane Alexander. Stockdale retired to Coronado, California, as he slowly succumbed to Alzheimer's disease. He died from the illness on July 5, 2005. Stockdale's funeral service was held at the Naval Academy Chapel and he was buried at the United States Naval Academy Cemetery. In 2014, Stockdale's son Stanford died of alcoholism at the age of 55. The U.S. Navy has named a number of structures after Stockdale, including the Arleigh Burke–class guided missile destroyer USS Stockdale (DDG-106), christened on May 10, 2008. At the Naval Air Station North Island in Coronado, California, the main gate (inaugurated on August 30, 2007) and the headquarters building for the Pacific Fleet's Survival, Evasion, Resistance and Escape (SERE) school were both named in his honor. In July 2008, a statue of him was erected in front of Luce Hall at the U.S. Naval Academy; the hall which houses the Vice Admiral James B. Stockdale Center for Ethical Leadership. He was enshrined in the the National Aviation Hall of Fame in 2002. In Love and War: The Story of a Family's Ordeal and Sacrifice During the Vietnam Years, Harper & Row, New York, 1984, ISBN 0-06-015318-0. In Love and War: The Story of a Family's Ordeal and Sacrifice During the Vietnam Years, Naval Institute Press, reprint 1990, Annapolis, Maryland, ISBN 0-87021-308-3. ↑ The candidates – James T. Havel – Google Books. Retrieved 2013-05-30 – via Google Books. ↑ Register of Alumni, United States Naval Academy, 1991. ↑ "Essay: 40th Anniversary of the Gulf of Tonkin Incident". ↑ Schudel, Matt (2016-03-19). "William B. Bader, official who helped uncover CIA, Defense abuses, dies at 84". The Washington Post. ISSN 0190-8286. Retrieved 2016-04-16. ↑ Lowry, Timothy S. (1989). Valor. New York: Berkeley Books. pp. 13–31. ISBN 0425119165. ↑ Lowry, Timothy S. (1989). Valor. New York: Berkeley Books. pp. 17–31. ISBN 0425119165. 1 2 "Medal of Honor citations". Vietnam War (M – Z). United States Army Center of Military History. June 8, 2009. Retrieved February 24, 2010. ↑ Adams, Lorraine (1992-03-11). "Perot's Interim Partner Spent 7½ Years As Pow", The Dallas Morning News, March 11, 1992. Retrieved on 2008-07-02 from http://community.seattletimes.nwsource.com/archive/?date=19920331&slug=1483968. "He was one of the Alcatraz Gang – a group of 11 prisoners of war who were separated because they were leaders of the prisoners' resistance." ↑ Rochester, Stuart; and Kiley, Frederick. "Honor Bound: American Prisoners of War in Southeast Asia, 1961–1973", 2007, Naval Institute Press, ISBN 1-59114-738-7, via Google Books, p. 326. Accessed July 8, 2008. ↑ Stockdale, James B. "George Coker for Beach Schools", letter to The Virginian-Pilot, March 26, 1996. ↑ Kimberlin, Joanne (2008-11-11). "Our POWs: Locked up for 6 years, he unlocked a spirit inside". The Virginian Pilot. Landmark Communications. pp. 12–13. Retrieved 2008-11-11. ↑ Collins, Jim (date unknown). The Stockdale Paradox. JimCollins.com. Retrieved on 2008-07-02 from http://www.jimcollins.com/lab/brutalFacts/. 1 2 3 "The Stockdale Paradox". VenChar. Retrieved 2013-05-30. ↑ WISCKOL, MARTIN. "POW mate calls McCain 'liar' over 'turncoat' charge". ↑ The Nation, "The Rockford File," October 26, 1992 (Volume 255). ↑ "The Political Fray". CNN. 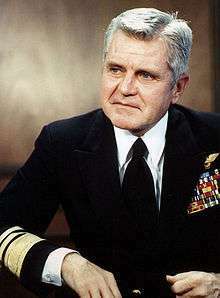 1 2 3 "James Stockdale Interview". Debating Our Destiny. PBS. September 4, 1999. Retrieved August 16, 2011. ↑ Schudel, Matt (2011-11-10). "Hal Bruno, former ABC News political director, dies at 83". Washington Post. Retrieved 2011-11-26. ↑ Weber, Bruce (2011-11-09). "Hal Bruno, Director of Election Coverage at ABC, Dies at 83". New York Times. Retrieved 2011-11-26. ↑ "Admiral Stockdale official website". Retrieved 2007-05-05. ↑ "Welcome to Navy Forces Online Public Sites". Stockdale.navy.mil. 2010-04-09. Retrieved 2013-05-30. ↑ "Vice Admiral James B. Stockdale Center for Ethical Leadership". Usna.edu. 2013-01-24. Retrieved 2013-05-30. ↑ "About the Stockdale Center". Retrieved 2014-03-12. ↑ "New Rink Named The Admiral James & Sybil Stockdale Arena". South Kent School. Retrieved 7 November 2014. "Son of Navy POW Recounts Father's Heroism in Vietnam". DoD (via American Forces Press Service). November 8, 2013.